Left to right: Aldo Billingslea, Margo Hall. Photo courtesy California Shakespeare Theater. August Wilson’s work was instrumental in the promotion of African-American theatre, and his Pulitzer-winning Fences, which depicts a family reacting to their patriarch’s slow disintegration, could be considered Wilson’s masterpiece. 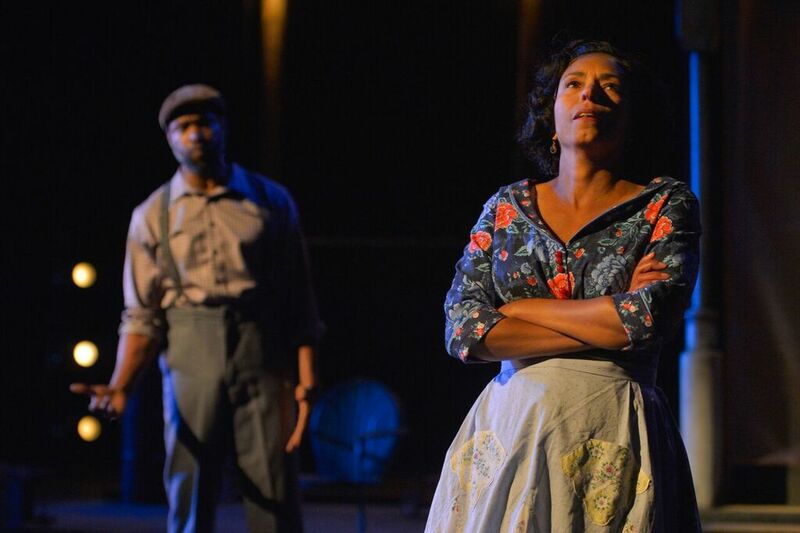 Director Raelle Myrick-Hodges’ rendition of this classic tale of pain, anger, and loss, currently playing at California Shakespeare Theater does justice to Wilson’s language and characters. Under her direction, the play’s themes are explored partially using a framework of women’s issues discovered within the text. Central to the story of Fences is Troy Maxson, a former baseball player and current garbage man who stands in the pantheon of American theatre’s deepest, most complex characters. Aldo Billingslea, a cornerstone of the Bay Area acting community, interprets Troy as a character desperate to believe that he is the hero of his own story. Troy is willing to do anything, from telling fanciful tales about wrestling with Death to exaggerating his children’s failings, to reinforce his belief that he is the sole good person in a world full of evildoers. As he falls over the course of the play and fewer people believe in or respect him, he works harder than ever to convince himself of his own lies. Billingslea’s Troy is not necessarily sympathetic, but he is, in his own way, understandable. Margo Hall plays Rose, Troy’s wife; in the program, director Myrick-Hodges notes that she had been confused and angered for decades at what seemed like Rose’s eternal tolerance of her undeserving husband. 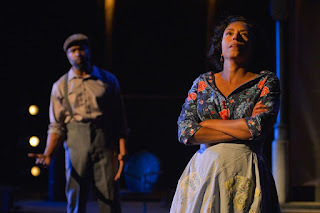 Under Myrick-Hodges’ direction, Rose’s willingness to forgive becomes a major part of her character arc, while she maintains a high status throughout the play, refusing to defer to Troy. Her actions don’t indicate subservience or undue loyalty as much as an unshakable moral compass and a desire to do what’s right. Myrick-Hodges integrates the theme of forgiveness throughout the play, interspersing interviews with local women about the subject during scene changes. Troy’s two children process living with him differently from each other: Thirty-four-year-old Lyons (Lance Gardner) has mostly cut ties and only drifts in to borrow or repay money, while teenage Cory (J. Alphonse Nicholson) has to balance his dreams of college football with living under his disillusioned father’s rule. Gardner’s Lyon is slick and friendly, but still shows a hidden honesty and vulnerability – indeed, his façade isn’t something he cares about maintaining among his family but rather something he picked up as a musician. Nicholson’s Cory defers to his father throughout much of the play, but he also pierces Troy’s lies most deeply, and he switches from innocence into outrage seamlessly. The rest of the cast is equally stellar. Guiesseppe Jones plays Troy’s best friend Bono; whereas Troy slowly descends into paranoia over the course of the play, Bono behaves roughly the same way he did at the beginning, serving as an emotional baseline that contrasts with Troy’s descent. Troy’s brother Gabriel (Donald E. Lacy, Jr.), suffering from brain damage, acts as both the subtle supernatural element present in many Wilson plays and as proof that there is some good within Troy – even at his worst, Troy always treats him with kindness. Most commendable is Lacy’s precise body language, with intense gazes and trumpet-playing hand gestures showing his eagerness to blast open the gates of Heaven. The technical side of the production is subtle yet clever. One of the challenges in producing Fences at Cal Shakes’ outdoor venue is confining a stage graced with a wide view of California’s rolling hills into the Maxson’s tiny property in the Pittsburgh suburbs. Scenic designer Michael Locher accomplishes this by barricading a tiny, screened-in cube of a house between the titular fence and a series of dusty patio furniture. With the exits covered, and much of the action taking place center stage, the set conveys the barrier Troy has chosen to create between his family and the outside world. Costumes (Alina Bokovikova) are time-period appropriate, but the children’s clothing is fresher and more modern than those of their parents, hinting at both economic circumstances and Cory’s yet-uncovered potential. Fences at California Shakespeare Theater is a breathtaking rendition of one of August Wilson’s greatest works. Director Raelle Myrick-Hodges reinterprets major themes in the play, choosing to illustrate Rose’s difficult decisions, bringing her further into the spotlight and giving the production a fresh perspective. Note: Actor Aldo Billingslea was my professor at Santa Clara University.